Word went out today that immediately after Arkansas decided to make Little Rock Schools non-public, the Walton family called a "focus group" meeting "in conjunction with the Boston Consulting Group. This is worse than finding the slender man in the back of your family portrait. For a public school system, this is finding the grim reaper at your front door. And he's not selling cookies. The Boston Consulting Group is often referred to as " management consulting group." That's not entirely accurate. BCG is one of The Big Three consulting groups-- the other two are McKinsey and Bain. People love working there, and the people who work there are recruited heavily from the very toppest universities. These are the guys that Fortune 500 companies call for help making money. Forbes lists them as America's 112th largest private company. Gutting and stripping school districts does not even require a tenth of their power or attention. They are officially scary. Read up on BCG and you find they have mainly three big claims to fame, and all of them are deeply bad news for public education. 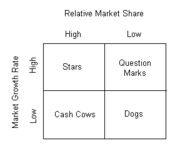 This is the growth-share matrix, used to help a corporation to decide how to allocate resources (aka how to figure out which losers could be starved out). Sound familiar? The experience curve is even simpler. The more a task is performed, the lower the cost of performing it. In other words, if you can reduce a process (manufacturing, service, whatever) to a series of simple tasks that will be repeated over and over, you can reduce the cost of the process. Sound familiar? This advantage matrix lets us divide businesses into one of four types in order to figure out which strategy best lets us cash in. 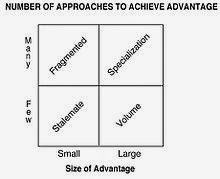 For instance, when a business is scaleable but hard to do differentiation in, the answer is volume volume volume. Sound familiar? BCG's arrival in Little Rock is unsurprising; they've been around the education block several times. They were in the news just last week when Parents United finally won a long court case to be allowed to see BCG's super-duper secret plans for Philadelphia schools, drawn up way back when Philly was first turned into one of the nation's largest non-public school systems, run by state-appointed executives rather than an elected board. A major feature of BCG's plan for Philly seems to be standard for them-- close this bunch of schools, and open up some nifty charters. In other words, cut off resources to the dogs. As a top consulting group, BCG doesn't come cheap-- their consulting fee in Philly was reportedly $230,000 per week. That's just under $33,000 per day. That's a little less than the starting salary for a teacher in Philly. Per day. BCG has proposed a similar program in Memphis. Reportedly Cleveland, Seattle, Arizona, and New Orleans have also felt the loving BCG touch. BCG also has close friends in the charter world, with several folks hopping back and forth between BCG and the board of KIPP. BCG joined up with many of the big players (Gates, Joyce) to form Advance Illionois. And they helped write North Carolina's Race to the Top bid (all these painful details and more can be found in this 2012 article at The Common Errant). Strive in Cincinnati-- that's BCG, too. And last fall, they were spotted doing development planning for Connecticut's education sector. • Laying the policy foundations for education innovation: Business action is urgently needed to ensure Common Core State Standards are actually put into practice, for example. • Scaling up proven innovations: Business leaders can partner with educators to scale up innovations that are already showing results. • Reinventing the local education ecosystem: Business can help educators set and implement comprehensive strategies to upgrade education in specific cities and towns. “Strengthening our schools is a big challenge. To get this job done, we must all work together. From designing new classroom tools to engaging with businesses, our educators must not just be included in the process, they must help lead it,” said Jeff Raikes, CEO of the Bill & Melinda Gates Foundation. That all reaches a fuller pitch in "Lasting Impact: A Business Leader's Playbook for Supporting America's Schools" (another BCG-Gates-Harvard joint production). It starts with an introduction that quotes the "rising tide of mediocrity," stops at "fortunately, we don't have to settle for incrementalism any more" and barrels down to more detailed discussion of the three strategies listed above.I may take you on a more detailed tour of this twenty-seven page tome, but for the moment, I don't have the heart to add one more gloomy chapter to this dark tale. Suffice it to say that it is a veritable bible for the corporate reformster. Bottom line? Say a little prayer for the formerly public schools of Little Rock, because BCG is in town and they're sharpening their axe. Is BCG affiliated in any way with Public Consulting Group, also based out of Boston? I researched this quite a bit last summer, but couldn't find a connection. PCG has their hands in many special education files across the country with Medicaid reimbursements. I like your post and it really gives an outstanding idea. I very much agree with your suggestions I want to know more major.